INTERVIEW WITH CHRIS GARNETT week 15 Player OF THE WEEK! THE 5.11 National Basketball League continued last night at two different venues. Team Temburong managed to edge past Team Brunei-Muara 'B' 79-74 at the Brunei Basketball Association (BBA) Basketball Court in Batu Bersurat. Meanwhile, two matches were played at the New Village Basketball Court in Seria, which saw Team Tutong defeat Team Seria 72-58 and Team Kuala Belait winning 73-57 against Team Brunei-Muara 'A'. Today will see Team Seria go up against Team Brunei-Muara 'A' at 6.30pm and Team Kuala Belait will face Team Brunei-Muara 'B' at 8pm at the New Village Basketball Court in Seria. The Women's category will be played between Team Temburong and Team Brunei-Muara at the BBA Basketball Court in Gadong at 6.30pm. THE 5.11 National Basketball League co-organised by the Brunei Basketball Association (BBA), Belait District Basketball Association and Tutong Basketball tipped off at the BBA Basketball Court at Batu Bersurat last night. Six teams in the Men's Category and three teams in the Women's Category are vying for honours in the month-long tournament which concludes on May 5. The opening ceremony started with a march-past of the participating teams and a recital of the players' oath led by Brunei-Muara's player Ahmad Termizi followed by a welcoming speech by Co-Chairman of the organising committee Darren Yap. Darren Yap said, 'The National Basketball League aims to provide a competitive platform for our young players. We hope that young players, especially those aged below 19, will learn from the senior players and continue to grow beyond the league.' The teams in the Men's Category are Juramas Magic - Brunei-Muara 'A'; YTE Basketball Club - Brunei-Muara 'B'; Goh Hock Kee Cub - Tutong; Belait District Basketball Association Oiler - Kuala Belait (sponsored by Michael Khoo); Wolf Basketball Club - Seria; and Kawan Restaurant Udang Gala - Temburong. The three teams competing in the Women's Category are Brunei-Muara, Tutong and Temburong District. Chairman Alex Kwang officiated the tournament with the first throw of the basketball for the opening match between Brunei-Muara 'A' and Kuala Belait. 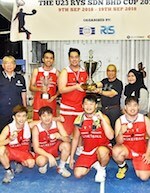 More matches will be played every Saturday and Sunday at three different venues - the BBA Batu Bersurat Basketball Court in Gadong in the Brunei-Muara District, Chung Hwa School Basketball Court in the Tutong District and the New Village Seria Basketball Court in Belait District. International brand 5.11, specialising in tactical gear, is the title sponsor of the National Basketball League, while You C-1000 is the league's official sports drink. THE Brunei Basketball Association (BBA) in collaboration with the Belait District Basketball Association and Tutong Basketball will host the first-ever National Basketball League, starting on April 6, to enhance basketball development among youth in Brunei Darussalam. 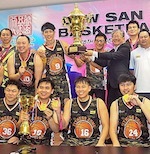 The new national league, which will replace the Inter-District Basketball Tournament, will feature Men and Women categories. Six teams will compete in the Men's category - Brunei-Muara 'A', Brunei-Muara 'B', Temburong, Tutong, Belait and Seria, while four teams will compete in the Women's category - Brunei-Muara, Temburong, Tutong and Belait. According to BBA, the national league will feature the 'home and away' format, which will see teams play against each other twice. This format has never been used in the Inter-District Basketball Tournament before. Games will be played in Brunei-Muara, Belait and Tutong districts. 'The main purpose of introducing the 'home and away' feature into the national league is to provide basketball fans in other districts the opportunity to support their home district team,' said Organising Chairman of National Basketball League Lim Fung. 'The 'home and away' format will also provide better collaboration between basketball associations and their officials,' he added. The National Basketball League will focus on providing exposure to young basketball players. Team Brunei-Muara 'B' will be mainly represented by players aged below 20. A tryout session for Brunei-Muara 'A' and 'B' teams will be held at the BBA Basketball Court in Batu Bersurat on March 9 at 7pm. Citizens and permanent residents are invited to attend.